Giant shuttles in the United States? Where? Who is responsible for them? What’s the story? Knowledgeable tournament badminton players and badminton fans in the United States will be happy to tell you about the giant shuttles located in Kansas City, Missouri, in the heartland of the USA. July 10, 1994, was the dedication day for the outdoor sculptures on the lawn of the Nelson-Atkins Museum of Art. To celebrate the arrival of the unusual art work, the Museum hosted shuttlecock Sunday,featuring live jazz, a celebrity badminton tournament,hands-on art projects for children, parades, and games. Shuttlecocks was created by the internationally renowned artist Claes Oldenburg and Coosje van Bruggen, his wife and artistic collaborator. Kansas City businessman and philanthropist Morton I. Sosland and his family commissioned the work and donated it to the museum. How did the artists conceive the idea for this project? The final concept took shape over the course of several visits to the Museum, beginning in March, 1992. Oldenburg and van Bruggen were immediately attracted to the long rectangular expanse of green lawn around the Museum. Some sort of playing field was suggested to them, with the Museum building as the game net. After considering several games, badminton was the most intriguing because of the multi-faceted character of the shuttlecock. The feather became a key element of the project concept. The shuttlecocks are made of aluminum, fiberglass-reinforced plastic, and urethane paint. Each shuttle weighs 4,500-5,000 pounds. The underground concrete foundation for each sculpture weighs 16,000 pounds. The shuttles are 17 feet tall, with a diameter of 16 feet at the top and four feet at the cone of each. There are nine feathers, each weighing 350 pounds. The feathers are painted white, and the corks orange. On-site assembly took two to three weeks. One shuttle is placed on the Museum’s north side, near the entrance it rests on two of its feathers. Another is placed on the terrace near the south entrance, resting on its cork at an angle. The other two are along the perimeter of the green mall area on the south lawn, one standing up perfectly straight on its cork, and the other resting at an angle on the cork. What was the reaction of Kansas Citians to this outdoor sculpture at the Museum? A Museum media person noted the reception had been diverse, but they were delighted the shuttlecocks were attracting attention. She also mentioned that wherever Claes Oldenburg exhibits one of his sculptures, much of the public likes his art, but often those who do not like the art eventually become endeared to it. She suspected this would be the case for Shuttlecocks. She agreed the Museum was very serious about the shuttlecocks just as competitive badminton players were serious about shuttlecocks. T-shirts with the shuttles sketched on them are available for purchase in the Museum gift shop, as are postcards and magnets. Badminton art in the heartland? Indeed! 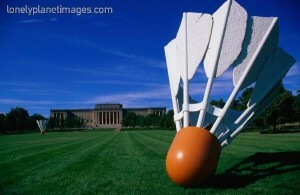 To see banners with shuttles on them flying near the art museum, and to see the actual giant shuttlecocks on the Museum grounds is almost too much to believe for a serious badminton competitor. You will be awestruck by the shuttles, and it is recommended you take the time to see them if you are anywhere near Kansas City. Here is someone finally taking badminton seriously, and badminton players are thrilled with the sculpture. The only question: Can you imagine the racquet you would need with these shuttles?